Birth*: Thomas was born at Illinois, USA, in 1866. Census1910*: Thomas was listed as the head of a family on the 1910 Census at Chicago, Cook, Illinois, USA. Thomas Hoy 44. Lived at 3917 Gladys, Chicago, Illinois in the 1910 U. S. Census. [S409] Chicago Daily News, December 29, 1947, 17. 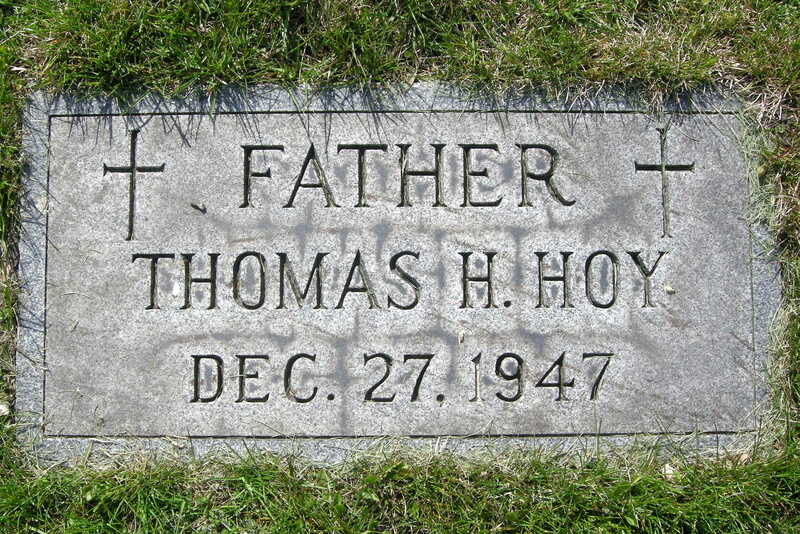 [S2069] Thomas Hoy Cemetery marker, Calvary Cemetery, Evanston, Cook County, Illinois, USA. [S2319] The Post and Courier, c 17 July 2007, on website http://www.legacy.com/obituaries/charleston/obituary.aspx, accessed May 14, 2016. [S1156] 1920 US Census, Illinois, Cook County, Chicago, Washington, DC, ED 1842, Ancestry.com, accessed April 3, 2010. Death*: He died on 23 January 2007 at Northbrook, Cook County, Illinois, USA, at age 90; Edwin J. Hughes, of Northbrook, Jan. 23, 2007, beloved husband of Rosemary, nee Riordan; loving father of John (Mary), Sharon (Ken) Christy, Edwin, III (Ann Brickson) and Thomas (Kathy); proud grandfather of Amy Brabender, Kathie, Molly, Brian and Brendan Christy, Christopher Hughes, Claire Brickson, Patrick and Timothy Hughes; brother of Noreen Young. Visitation Saturday, 10 a.m., until time of funeral Mass, 10:30 a.m., at St. Norbert Church, 1809 Walters Ave., Northbrook. Interment All Saints. In lieu of flowers, memorials may be made to University of St. mary of the Lake, Attn: Development Office, 1000 E. Maple Ave., Mundelein, IL, 60060. Arrangements by N. H. Scott & Hanekamp, Glenview, 847-998-1020. [S1560] Chicago Tribune, April 11, 1968, page W11, ProQuest, accessed April 28, 2012. [S1561] Chicago Tribune, January 25 2007, page 11, ProQuest, accessed April 28, 2012. [S734] June 18, 1900 US Census, Illinois, Lake County, Deerfield, Washington, DC, ED 132, Page 21B. [S734] June 18, 1900 US Census, Illinois, Lake County, Deerfield, Washington, DC, ED 132, Page 21B, Accessed November2, 2006 Ancestry.com. [S731] 1880 US Census, Illinois, Lake County, Vernon, Washington, DC, ED 230, Page 443, Accessed Ancestry.com November 11, 2006. [S735] Hutter-Haben Marriage: Certificate No. 44747. [S1423] Sullivan-Jenneman marriage license, no. 255070: South Dakota Marriages, 1905-1949, Ancestry.com, accessed October 26, 2011. [S1179] Mary Jesswein Cemetery record, Queen of Heaven Cemetery, Hillside, Cook County, Illinois, USA. [S1346] Cook County Clerk's Office, online http://www.cookcountygenealogy.com, Jesswein, R Judy &, accessed April 20, 2010, file number 610086.